Shannon Berrey of Shannon Berrey Designs sent me a quick note detailing how she used the same x-benches from Sears that I recently recovered for my bedroom. However, Shannon took her redesign of the x-benches into a completely different direction by painting the base and sewing slip covers. The benches were part of a showcase room she did and all I can say is WOW! I love the green color Shannon chose for the base of the benches along with the fun striped fabric of the slip covers. 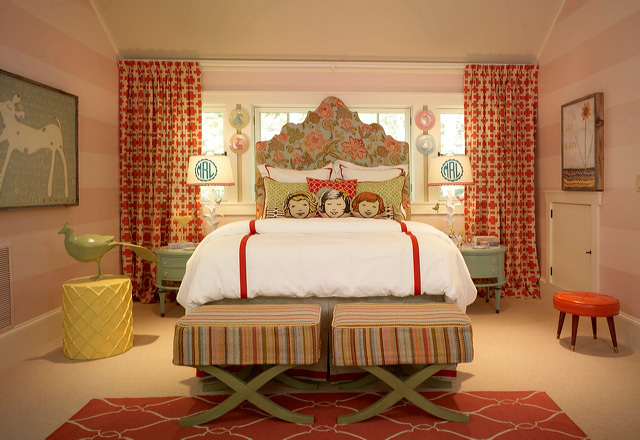 The benches really anchor what is a fun, contemporary and simply awesome little girl/tween’s room. The room has it all from pattern, texture to personalization! If I had a daughter, this would be close to the room I would want to give her. But what I love more is that this simple bench from Sears/Kmart has been re-interpreted by myself and three other bloggers/designers in very different ways. It just emphasizes that investing in a piece of furniture with good lines can be the basis for various design jumping points. If you have used this x-bench in your home decorating projects, please send me a pic! I would love to see how we all are using it in our own unique and fun ways! This entry was posted in Home and tagged Furniture, Home & Garden, Home and Garden, Interior design, Sears, X-bench by Courtney Out Loud. Bookmark the permalink. Well,I am obviously a little late on my blog reading–just saw your post (and my room!) Thanks so much for sharing it! It is fun to see all the creative interpretations in the blog world. I just found shannon’s blog…and I love her use of color!! !